There are a few groovy things that are going on in town that I think are worth mentioning. 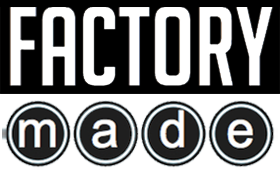 First up is the grand opening of Factory Made, which is a shop dedicated to the production and sale of locally-made, hand-made items. They had an open-house this past Saturday that was filled to the brim with great looking wares and Boulder’s well-heeled crowd of designers and those that wished they could design (that would be me). I checked out the lab area, where a a full suite of sewing machines was on display. There was also a huge back room, which seemed to intentionally designed to throw clay and paint around. Despite my best intentions, I did not walk out with anything. I was too busy people watching, admiring all the great objects and trying to narrow down what I would buy first, that I didn’t buy anything. I have filed the memory of a couple of pieces that if they stay at the foreground of my thinking, I’ll saunter back in and get. It’s hard being a minimalist when you keep finding well-made, local stuff you love. Controversially, well, at least for a town where the biggest issues seem to be around the glut of gluten-free products, Factory Made changed the mural on the side of their building. It was completely in their purview to change the mural, as I think they own the building.The original mural was a slightly dated message around domestic violence but, of course, because of the content it did raise some conversation. On a separate and an unrelated matter, I finally rode into work Monday and Tuesday. I had been fighting a chest cold, 18inches of snow and winter fatigue. Every excuse but the third one had any real validity to it so I fought the urge to snuggle deeper into my bed and rode the 3 miles into work. Actually, to be completely honest the car is the shop, so there was no alternative. But once I was out, it actually felt really good. It’s amazing how quickly you can get out of the habit of something you enjoy. Like most activities there are some elements that you care for less than others but during a break sometimes the features that most turned you off loom largest in your mind. (or my mind, at least). And it takes a more concentrated effort to reengage and then be reminded why liked to do something. Having said all that, I DID NOT RIDE TODAY into this wind-storm of badness!